When Indian food was less common in the United States, the best place to look for it was almost always near a college campus. Delhi Palace, located just a block east of the University / Rural light rail station near Arizona State University in Tempe, was not quite the first Indian restaurant to open in Phoenix. Nevertheless, since its founding in 1989, the restaurant has operated longer in the same location and under the same ownership than any other. These days, Delhi Palace faces a lot more competition — not only in Tempe, but throughout the metro area. Delhi Palace has responded to the competition by continuing to do exactly what it has done for nearly two decades: Offer crowd-pleasing mostly northern Indian food with a familiar menu, moderate spice levels, typical Indian restaurant decor, and the nearly inevitable lunch buffet. All these qualities make Delhi Palace hard to distinguish from other Indian restaurants, but the restaurant still feels like an old friend not to be forgotten in the face of competition from newer rivals with differences in regional emphasis or ambiance. 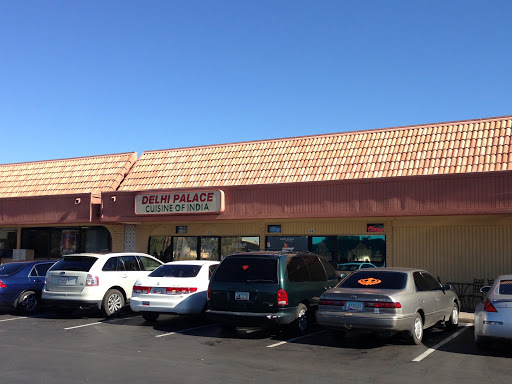 Delhi Palace very well be the longest-running tenant in Tempe Towne Plaza, a strip mall that has always been home to an eclectic assortment of restaurants of varying nationalities along with the stray head shop or copy center. 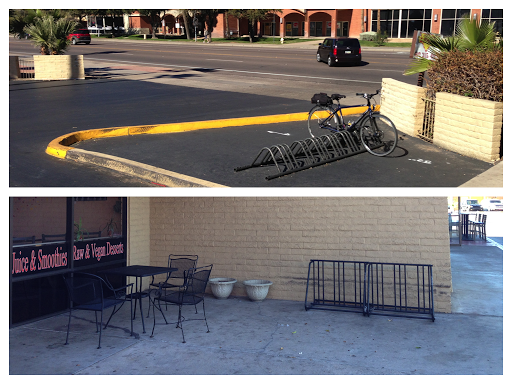 There’s a bike rack near University Drive outside the FedEx Office store and another toward the back where the L-shaped plaza bends. For both pedestrians and bicyclists coming from the rail station, a scraggly path from 8th Street may be a quicker route than University. Inside, the restaurant is dark with all windows covered and Indian classical music playing. 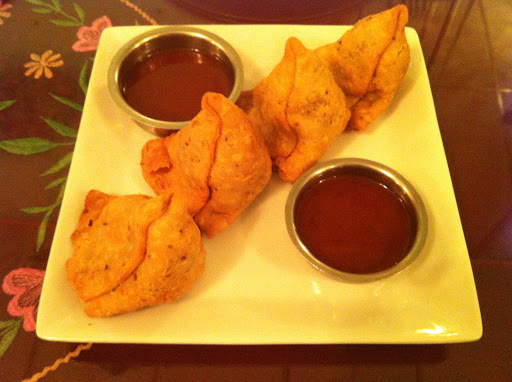 Appetizers include a variety of fried treats, the most popular of which are probably the vegetable samosas, stuffed pastries full of vegetables and peas. 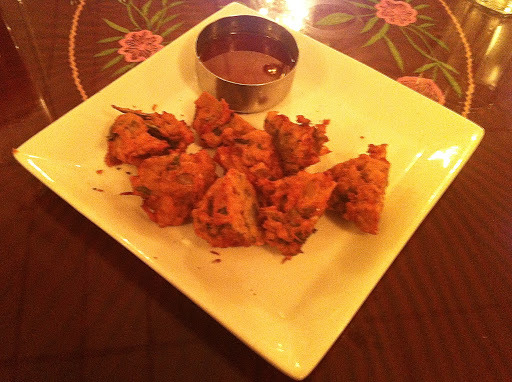 Pakoras, minced vegetable fritters served with chutney, are in a similar vein. Papadam, flat lentil wafers, are often provided free during dinner. In a nod toward the growing popularity of southern Indian food, the restaurant has recently added items such as “Bombay Spice Bhel Poori,” a snack food based on puffed rice. At first glance, it looks like a breakfast cereal, but the taste is salty and savory rather than sweet. 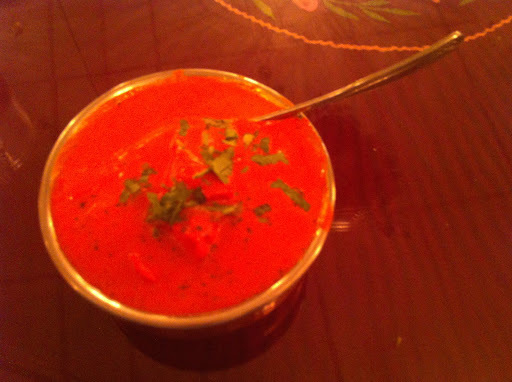 Like almost all Indian restaurants, Delhi Palace offers a large selection of vegetarian dishes; however, Delhi Palace proves that meatless eating doesn’t always equal light eating. Even those dishes that rely on legumes and vegetables for their bulk tend not to skimp on cream, paneer, or ghee, the elements that often make Indian restaurant food richer than its healthful image would suggest. 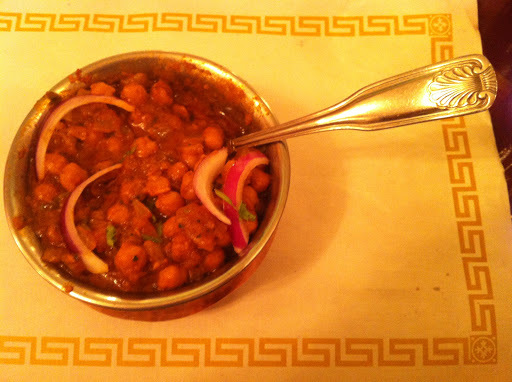 Putting calorie counting aside, meatless favorites at Delhi Palace include aloo gobi, a mixture of potatoes and cauliflower, and chana masala, a stew of chickpeas with ginger and fresh cilantro. 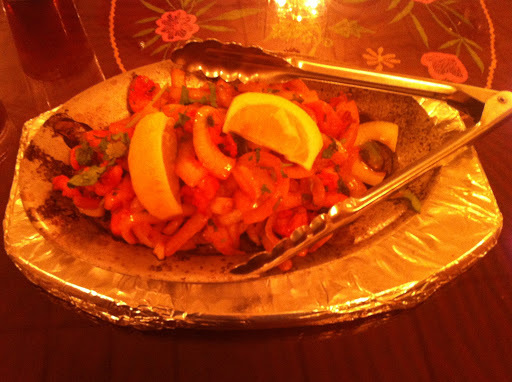 For those who prefer meat dishes, Delhi Palace has menu sections devoted to chicken, lamb, beef, and seafood. Beef is not always available at Indian restaurants, but there is no taboo against it here. The tandoori dishes let meat stand on its own with a gentle yogurt-based coating, while the curries surround it in flavorful sauces, mostly mild but becoming more fiery in the case of vindaloo. The seafood dishes incorporate either shrimp of unnamed white fish. Both ingredients appear to be frozen and often turn out overcooked. For best results, stick with the land-based protein sources. Most customers will probably want to augment their meals with a rice dish and one of nearly a dozen types of bread. The garlic naan is a dependably good choice, but those looking for less fat and more fiber may prefer the roti, a tortilla-like bread made with whole wheat flour. 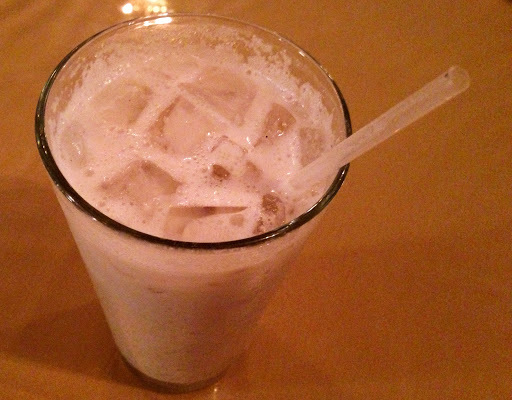 For beverages, Delhi Palace offers several yogurt drinks, fruit juices, soda, big bottles of Indian beer, and wine. Desserts include Indian restaurants such as kheer, rice pudding with almonds and pistachios, and gulab jamun, small cheese balls with a texture like donut holes. Of course, a large amount of Delhi palace’s business if the lunch buffet, which is served every day from 11 AM until 2:30 PM. The buffet has become a cliche at Indian restaurants nationwide, but if you’re going to eat at midday, it’s probably better to succumb to the all-you-can-eat model than order from the menu when the kitchen may not be focused on a-la-carte cooking. The buffet lineup here doesn’t change much from day to day. There are always four meat dishes, four meatless ones, rice, salad, chutneys, pakora, and a selection of sweets. Expect tandoori chicken, all legs and thighs; chicken tikka masala, poultry in creamy pink-orange sauce; keema matar, a dish of minced lamb; and goat curry, an item not on the regular menu. On the vegetarian side, palak paneer, spinach with cubes of mild cheese, is a perennial, as is a dark brown daal maharani, or lentil stew. Other selections on any given day might include malai kofta, vegetable balls in a cream sauce, and curries with potatoes and bell peppers. 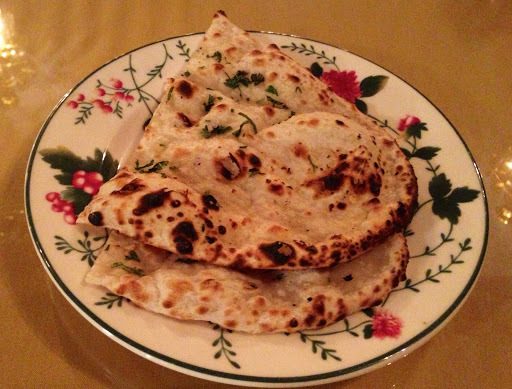 Naan is the only item except beverages that is brought to the table. It’s fresh and warm rather than sitting in a steam tray. The buffet also includes a few desserts unavailable from the menu such as mango custard and Indian carrot cake. Beverages are extra, and the lassis are generally worth the money and calories for a salty version that tastes of cucumber and mint or a sweet one with or without mango. If you eat Indian food often, you’ve probably heard all this before, and you won’t find much new at Delhi Palace. If you’re looking for a familiar approach to Indian dining that’s been in place since the ’80s, however, Delhi Palace is a campus classic that’s worth a return visit long after graduation.